We prepared a booklet from responses from the 40th Reunion Questionnaire. 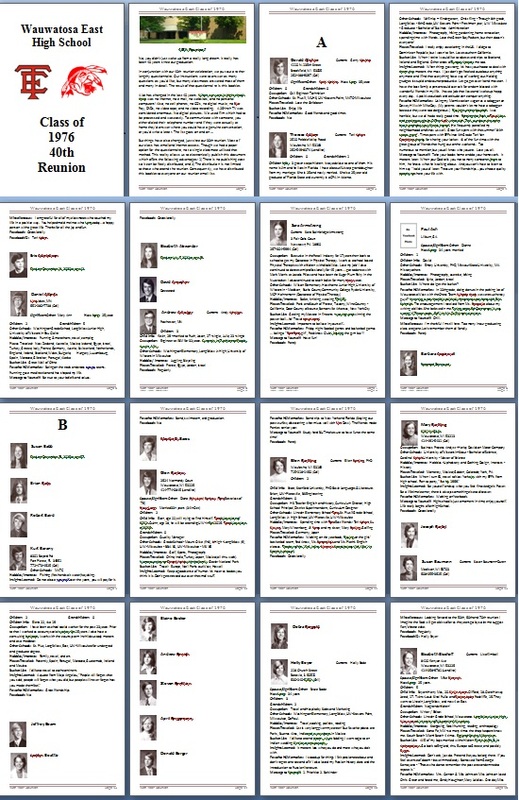 186 of our classmates filled out a questionnaire and as a result we produced a 240 page booklet from those responses. The above image give you an idea of what the resulting booklet pages looked like. But you might notice you cannot see the actual details. Because of privacy concerns, you cannot download a copy of this booklet from the website because it is simply not on the website. The only way to get a copy of the booklet is via email and for that, you have to have registered your email and belong to our Google Group. Contact us if you're a classmate and would like a copy. However, if you click here, you can see the start and end of the booklet which do not contain private information.